A rock concert featuring local and Thailand band will be held in Hanoi Creative Cityon on February 26. 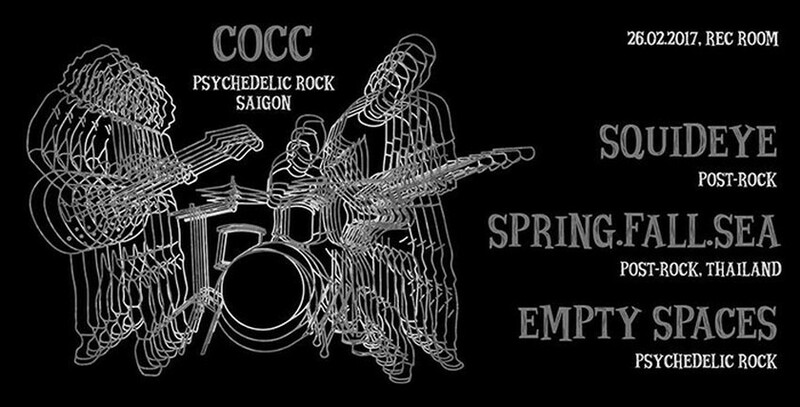 The show will be a night of psychedelic rock music with the participation of the COCC, Empty Spaces, Squideye and Spring.Fall.Sea. The COCC from Ho Chi Minh City released their debut album “6 gio” (6 hours) in 2011. The gorup performed in Hanoi twice before. They will return to the capital in this time to present their some new songs from the upcoming release. The Spring.Fall.Sea was formed in 2015 in Bangkok. They released the first album titled “Deep Down, All Of Them Felt As He Did” and a music video. The band self-booked a long tour in Europe and Asian countries during the last few months. The Empty Spaces were established in 2013 in Hanoi. Their debut CD “Tien hoa” (Evolution) was presented to the public in the end of 2016 . Being under strong Pink Floyd influence, their songs sound like a psychedelic space trip with enchanting guitar/keyboard tunes and stunning vocals. Founded in Hanoi one year ago, the Squideye has won music lovers’ hearts with their appearance at the Quest Festival 2016 in Hanoi last November.